I’m a fan of Method cleaning products because they smell good and use natural, plant-based ingredients rather than harsh chemicals. They’re found at most big box retailers like Target and Walmart as well as at many regular grocery stores. Aldi caught my attention recently when it sold bottles of cleaning spray under the store’s Radiance brand name that were clearly imitations of Method’s products. Radiance is Aldi’s house brand for cleaning products, and other items in the product line include dish washing detergents and cleaning wipes. Aldi’s Radiance cleaning sprays were advertised as ALDI Finds (Special Buys), but the Aldi store I usually shop at stocked them among all the Regular Buy cleaning products, so I’m uncertain whether these products will stick around long-term on Aldi shelves. If you want to try them, I’d recommend buying them right away and not delaying. All three Radiance cleaners that look like Method products claim to be non-irritating to the skin and, just like the Method brand, they have not been tested on animals. 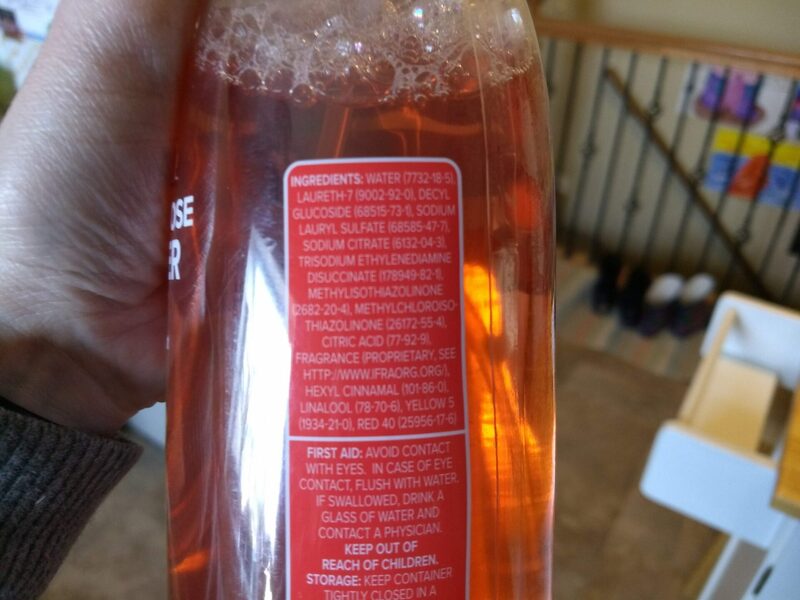 The Radiance cleaners all have a Safer Choice label indicating they meet U.S EPA Safer Product Standards for human health and the environment. The Method brand cleaners have a trademarked non-toxic plant-based Powergreen technology, but the Radiance cleaners simply state they contain plant-based cleaning agents and make no mention of any trademarked formula. The Radiance cleaning sprays clean my house just as well as Method cleaning sprays. The spray mechanisms work fine, putting out the right amount of cleaning product where I want it to go. However, I have noticed that sometimes the nozzle drips a bit on my fingers after I’ve squeezed the sprayer trigger. It’s a minor annoyance but not a deal breaker. The biggest difference I noticed between brands is that Aldi’s Radiance sprays have a longer-lasting scent. I cleaned my kitchen with the Radiance Multi-Purpose Cleaner, and my family and I could still smell it several hours later. Even the next morning while working in the kitchen, I kept catching whiffs of the spray scent. I have not noticed the scent lasting so long when I’ve used Method products. The Radiance sprays all have scents with vague names (what does a moonlit canyon really smell like anyway?) that hint at something floral-like with fresh notes that remind me a bit of air freshener scents like clean linen or fresh linen. In contrast, Method carries specific floral scents like lavender and wildflower, and Method also offers an array of different scents that I find refreshing and like better, such as pink grapefruit, almond, honeycrisp apple, clementine, and mint. For the price, though, it might be worth sticking with the Radiance sprays. 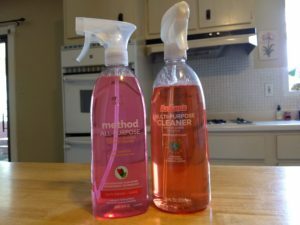 Method’s all-purpose cleaner, which I already had stocked in my cleaning cabinet for easy reference, claims to “cut grease and grime.” In comparison, Aldi’s Radiance Multi-Purpose Cleaner also claims it “removes grease and grime” and “contains plant-based cleaning agents.” The two products look pretty similar, although perhaps not identical, in terms of ingredients. Some of that may have to do with the fact that I’m comparing different scents across brands, but Method does not appear to have any scents comparable to the Aldi Radiance brand. The bottles state both products are good on counters, tile, wood, glass, and stone. The Radiance spray instructs to simply “spray and wipe clean,” and both the Radiance and Method brands advise testing in an inconspicuous place first. So far, I’ve used this on my dining room table, kitchen counters, kitchen sink, and stove top. When I wiped everything down with a damp cloth after spraying, it got rid of residue and gunk, and it added a bit of shine to my dining room table. 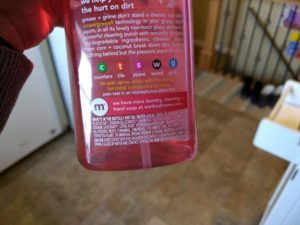 Just like the Method brand, the Radiance bathroom cleaner says it removes soap scum, mold stains, and mildew stains, and the Radiance cleaner “contains plant-based cleaning agents.” A comparison of ingredients between the Radiance and Method brands indicates they aren’t exactly the same, but they are similar. The Radiance Bathroom Cleaner bottle states it is good on showers, tile, tubs, fixtures, and chrome. Simply spray and wipe clean (after testing in an inconspicuous place). No rinsing is needed. It worked as expected when I sprayed and wiped bathroom showers, tubs, and sinks. Radiance Glass & Surface Cleaner, similar to Method glass cleaner, says it leaves a streak-free shine, and the Radiance glass cleaner “contains plant-based cleaning agents.” It also is ammonia-free. Again, ingredients are not exactly the same between the Method and Radiance brands. The Radiance Glass & Surface Cleaner bottle states it is good on counters, tile, granite, glass, mirrors, and windows. Just spray and wipe clean (after testing in an inconspicuous place). This got rid of smudges and spots on my bathroom and bedroom mirrors and made them shiny. I appreciated that it does not have the harsh ammonia smell of traditional glass cleaners like Windex. It’s also more versatile than traditional glass cleaners because I can use it on my counters. 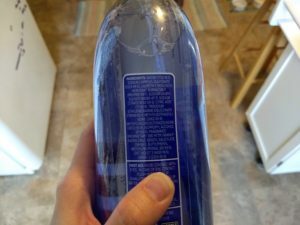 Aldi’s Radiance cleaning sprays look and work like name-brand Method cleaning sprays. 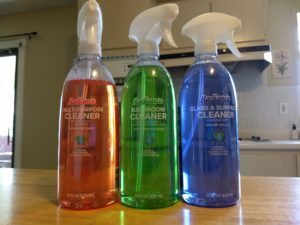 They come in three varieties: multi-purpose cleaner, bathroom cleaner, and glass and surface cleaner. The cleaning sprays have scents with somewhat floral tones, and the scents are longer-lasting compared to Method products we’ve used before. We’re not sure whether these will be sold all the time as Regular Buys or if they are limited-time ALDI Finds (Special Buys), so if you want to try them, don’t delay. 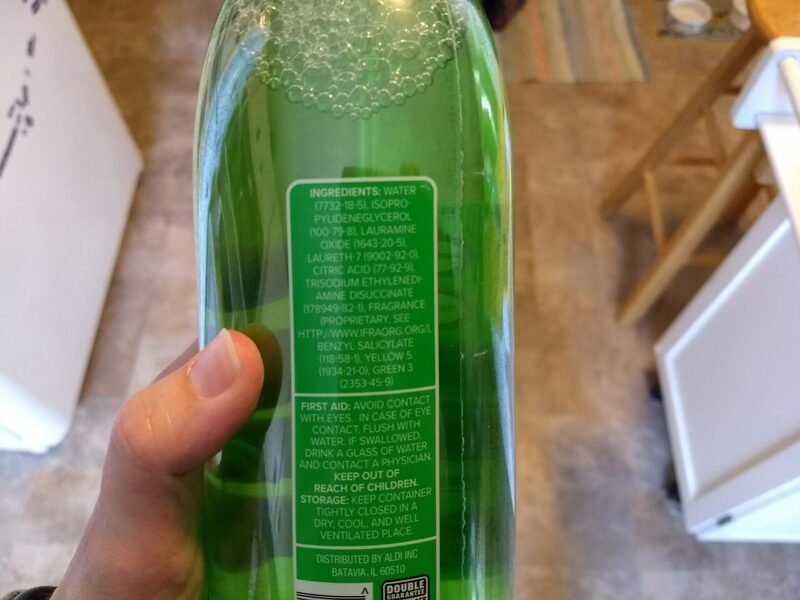 Most Aldi stores sell a Radiance dish washing soap that does not foam. I am not familiar with a foaming dish washing soap from Aldi. How well did you find the sprayer part of the container functioned in comparison with the Method sprayer bottle? Unfortunately this has become one of the major factors determining which brand I purchase since so many ‘sprayers’ are malfunctioning, weak, or finicky in some way. The sprayer mechanisms work fine. No complaints at this point. On second thought, as I’ve continued to use the Aldi spray cleaners, they spray just fine, but the mechanisms do dribble on my fingers a bit sometimes after I’ve sprayed them. It’s not a deal breaker, as the cleaning product comes out of the sprayer and goes where I want it to go all right. The dribbling is just a minor annoyance. I’ll be updating this post to reflect that.